To make shopping as pleasant as possible for customers, and even to make an experience of it, shops and shopping malls need a pleasant atmosphere. In addition to attractive design of the sales rooms and a product presentation to match, it is a pleasant room temperature and air quality that decide how long the customer lingers in the shop. 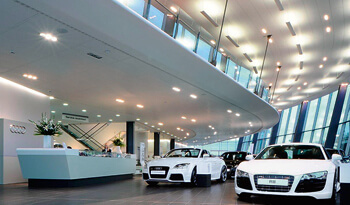 It doesn’t matter whether it’s a car showroom, a shopping mall, a shoe shop or a boutique, shop fitting requires an open and welcoming design and attractive product presentation, and creating for the customers a “feel-good” atmosphere with fresh and pleasant air and the right degree of humidity. When selecting the right air-conditioning system, many factors come into play: comfort, efficiency, costs and not least appearance. So a sensible yet economical air-conditioning solution is needed, both effective and energy-efficient, comfortable, flexible and space-saving – and also either visually attractive or so unobtrusive that it fits seamlessly into the design concept and does not alter the feel of the room. LTG meets all these requirements: with energy-efficient air/water systems, visually attractive air diffusers and precision components for air distribution, we together create an atmosphere that people like to linger in. The range of LTG air diffusers for ceiling installation extends from visually attractive linear diffusers LDB in many versions (also as LTG System clean®) to the "invisible" ceiling air diffuser DSA AirPanel, which can be integrated practically imperceptibly into stucco/acoustic ceilings. LTG floor diffusers such as LDU/LDU-W can be combined with a wide range of floor units with a uniform appearance (LTG SystemDesign). For removing thermal loads, LTG air-water systems are suitable as fan coil units LTG FanPower for ceiling installation or floor units for efficient use of the available space – thanks to LTG SystemDesign in a uniform appearance with floor diffusers. The use of convenient induction/chilled beam technology LTG Induction as a floor and ceiling unit is also possible. Precision components from LTG air distribution for optimum air supply to rooms, such as the flow rate controller VRE/F in round and angled versions – also with LTG System ActiveControl and as a dual controller VRD for supply air and return air control in parallel-routed air lines – and the pressure controllers DRE/F and valves and accessories round off the planning for your air-conditioning System. LTG mixed/displacement ventilation: Builds on the benefits of displacement air ventilation to achieve high cooling capacities and excellent thermal comfort even in very deep rooms. LTG TransientFlow: Transient and highly inductive pulse ventilation for high thermal comfort combined with exceptional energy efficiency. LTG demand-controlled ventilation: Active control from within the room of the required outside air volume and minimised energy costs for air conveyance and preparation. LTG ActiveControl: Volume flow control with map-based control and minimal pressure loss. High precision, in particular in low volume flows. LTG SilentModule: A modular system for air boxes that can be adapted for use in different wall and ceiling structures and are pre-equipped with cross-talk sound attenuators. LTG PulseVentilation system: Decentralised and non-stationary air conditioning, cost-effectively implemented using one of the oldest concepts in the world: breathing.